On this homecoming tour, both John Jones and his walking friend Colin Kirkby raised money for their charities: John for Macmillan Cancer Support and Colin for St Michael’s Hospice. There are 12 Macmillan nurses who work at St Michael’s so there is much synergy between the two. Both John and Colin had Just Giving pages that made it easy to donate. 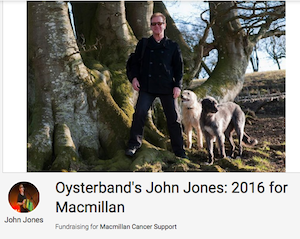 John raised £7,220 through this page, including all the donations made during the two walking tours, which put him into the top 1% of their fund-raisers in 2016. 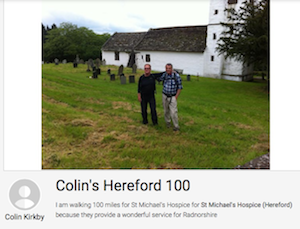 Colin raised £1,100 for St Michael’s Hospice through the Hereford 100 walking tour. When put together with other fund-raising efforts, Colin raised £5,350 for them over the year.. The above map is only an illustration of the general walking route and the places to be visited. Sunday: Walked the Herefordshire Trail from Bromyard to Malvern. Left the Hop Poles in Bromyard at 9am. This was a long 19 mile walk. Lunch stop in Bosbury at The Bell Inn. No music planned for the evening. A well earned rest. Monday: Walked the Malvern Hills to Ledbury. Around 12 miles. Met 9.45am in Rose Bank Gardens in the centre of Malvern (click here to see the location – place E on the map). We left at 10am to walk up to the Worcestershire Beacon, going past St Anne’s Well (but it was too soon to stop). We walked along the hill ridge to just before British Camp for lunch at the Malvern Hills Hotel. Click here for their bar menu. The weather was perfect for walking – dry, cloudy so not too hot and clear enough to enjoy the excellent views. We had an evening gig at the Royal Oak in Ledbury. Click here for details of the gig. Tuesday: Met 9am at the Market House in the centre of Ledbury to walk to Hereford. Around 18 miles. Lunch stop at The Crown Inn in Woolhope. Click here for their menu. We followed the Herefordshire trail in the morning and the Wye Valley walk in the afternoon. We had an evening gig at The Barrels which is where JJ & RR played on their very first walk in 2009. Click here for details of the gig. 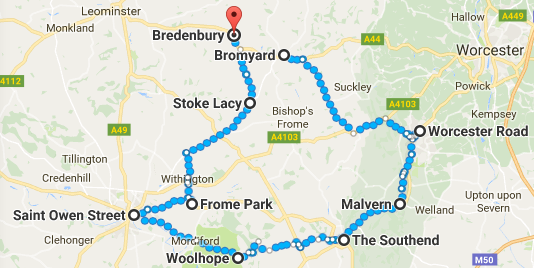 Wednesday: Walk started at 9am from the St Michael’s Hospice, Frome Park, Bartestree, Hereford HR1 4BF. This is 5 miles east north east of Hereford. The walk followed the Three Choirs Way. Lunch stop was at the Wye Valley Brewery in Stoke Lacey and next door for food at The Plough Inn. After lunch, we followed the Three Rivers Ride to the Barneby Inn at Bredenbury, HR7 4TF, just outside of Bromyard. This walk was a long walk of 9 miles in the morning and 10 miles in the afternoon. Thursday: Started at the Barneby Inn in Bredenbury HR7 4TF at 9am. This was a lovely morning walk of 10 miles and followed the Herefordshire trail to the Stockton Cross Inn HR6 0HD for lunch. We then followed the Stockton Ride to Yarpole which was another 5 miles. Evening gig at the creatively and beautifully restored Yarpole Church. The evening meal was at the Bell Inn, just 5 minutes walk from the church. See here for more information of the welcome in Yarpole for the Reluctant Ramblers. Friday: Started at 9am. Walkers were be seen off in style from Yarpole. We started from the Parish Hall (HR6 0BE) where car parking was available in return for a small contribution to Hall funds. Also coffee/tea and croissants were available there for anyone who could not get breakfast or who needed extra fuel. A packed lunch (pre-ordered) was provided by The Gallery Café organised by Rose. They comprised sandwiches, crisps, cake and fruit and were collected on the Friday morning from the start of the walk. Sandwich choices were: Cheese and cucumber / Ham / Egg and cress. We walked along Fishpool Valley then Mortimer’s Trail from Yarpole to Leintwardine. Around 13 miles with a picnic lunch. After a well earned drink at the Sun Inn, we got a fish and chip supper from the Fiddlers Elbow Fish Bar, before an evening session at the Sun Inn which was organised by Jill and Mark from local band, The Rhythm Thieves. Saturday: This walk was 16 miles from Leintwardine to Kington as part of the Kington Walking Festival. The morning followed the Herefordshire trail to Presteigne for lunch at the Dukes Arms. Then back onto Mortimer’s Trail and finished on Offa’s Dyke to Kington. Evening gig was at The Burton Hotel, Kington, organised by the walking festival. Click here for details of the gigs on this tour.